I used three polishes to make this: Cover Girl Boundless Color Pink Twinkle, Sally Hansen HD Hi-Res, and Cover Girl IceSlicks Pink Ice. I was a bit concerned that the shimmer in Hi-Res would swallow up the mini-flakies and glitter in the other two, but it turned out okay. It's on the sheer side, to be sure; the swatches above are four coats. That's not super surprising, since the HD line isn't known for its opacity and the other two polishes are basically special effects top coats. It's not so sheer that I wouldn't wear it alone, but it's sheer enough that I had to try some layering with it. 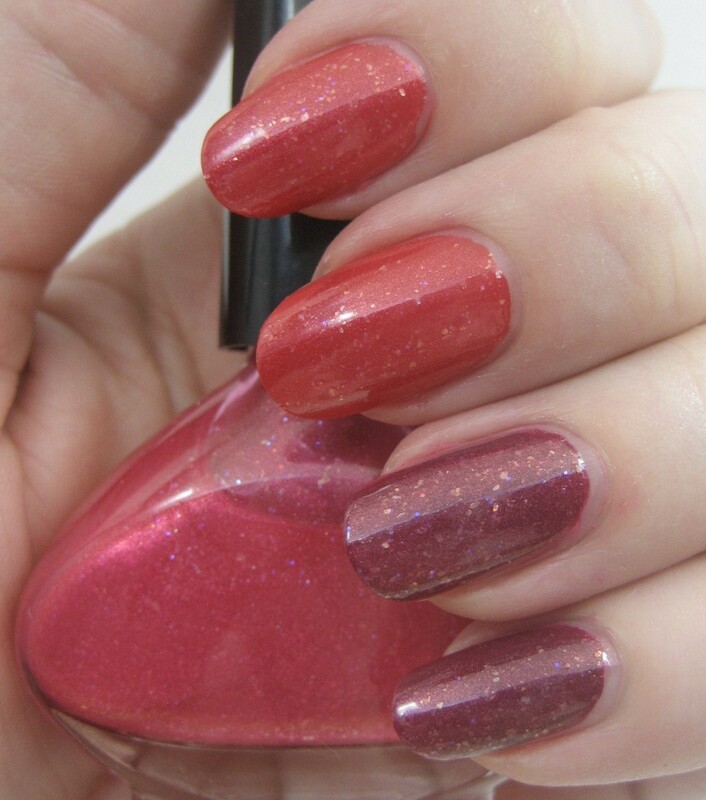 I grabbed Essie Red Nouveau and Borghese Palermo Plum to serve as base colors, then added one coat of the franken. 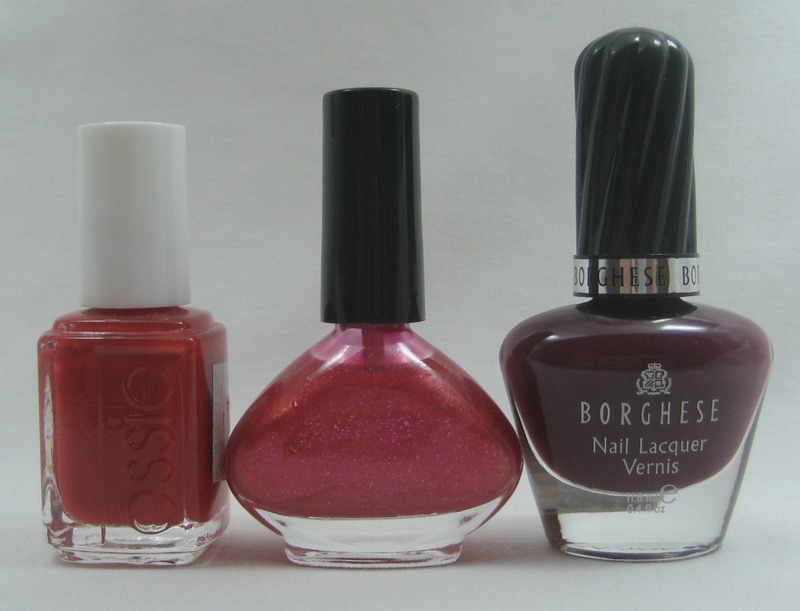 I like it okay on the red but adore it over the plum! Names for frankens usually come to be by the time I'm done swatching them, but this one didn't tell me what it should be called. What do you suggest? Have you tried frankening? I love it when I have the house to myself can get things down especially when hubby is gone. I have not tried frankening yet-am a little scared of a big fat mess! 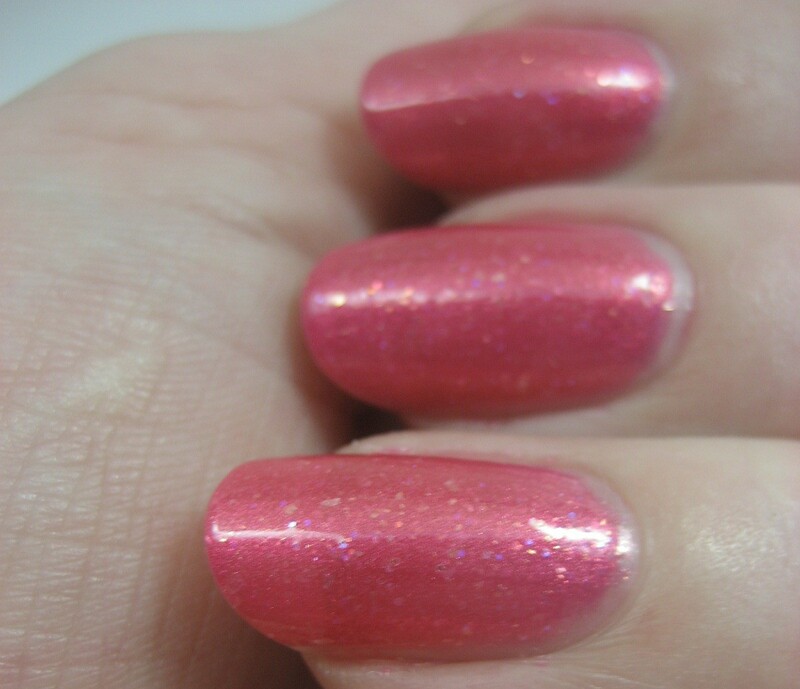 I love this on the Borghese polish! How about calling sparkabarbilicious? Very pretty, I love it layered over the plum. I try to franken but when I sit down I lose all concept of what I want to do. So pretty! It looks great by itself and so pretty layered! You could call it... um... I'm having a little brain fart right now, but I"ll think on it! Love this one, which of the polishes you added had the flakies? NIce mixing!!! I love it over the plum too! Way better on that polish than the red.... I need to mix my own polish. Is it messy? I love it over the plum, but it's great on its own, too, because it has so much depth with that many coats. It looks like galaxies. Made of candy. Looks beautiful! Sorry, can't come up with a name as have no creative talent for this type of stuff but I thought ose something when I seen it...like rose fleck garden or something....I haven't tried frankening yet...maybe one day when I have a Saturday morning with the house to myself, I'll give it a try! gorgeous! your sooo good at doing them! Oooh! I like it! When it's layered over Borghese, it almost looks like Cult Nails Captivate. I'm horrible at names...Sparkleberry? It does look fabulous over the plum! Cute franken looks amazing over the plum, maybe u can use words from what u mixed maybe twinkle ice or some version of that twinkle coral ice idk good luck. so super pretty! you have a good eye for frankening my dear! The depth of the sparkles is really gorgeous, well done! This franken looks awesome - I love it over the plum. I tried to franken in the past... and came up with colours so ugly that I did not even think it was humanly possible to come up with colours that bad. No, for real. I am terrible at names... How about Reel Depth? Thanks, everyone! Some great name suggestions; I'm mulling them over now. Bunny Masseuse, the CG Pink Twinkle is the one with the mini-flakies. 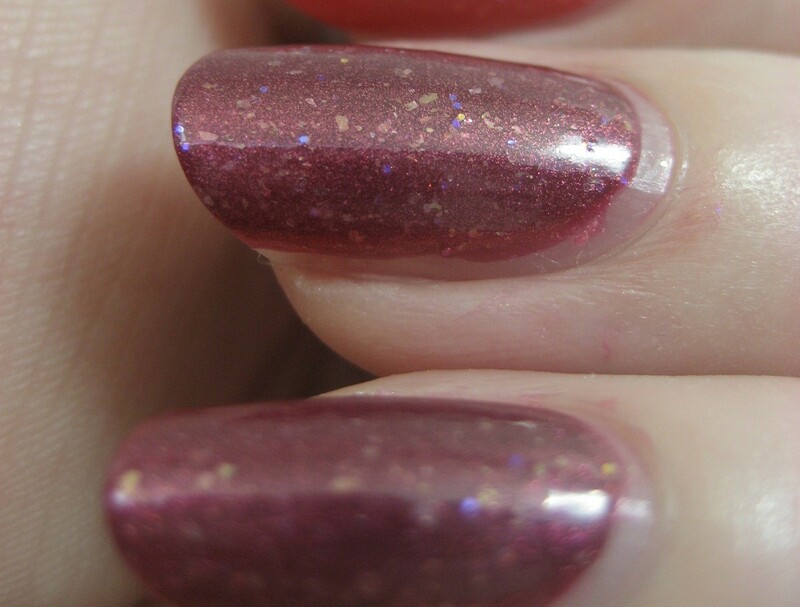 imfeelingnail-venturous, it's not too messy, especially for one like this where there's no loose glitter or pigment involved. Just in case of spills, I do cover the table with newspaper first. Do These Stripes Make My Nails Look Fat?